We haven’t posted much on the Stromberg Pontiac project for a while. So here’s a few ‘before and after’ pics of the body. After 38 years in a barn she needed a lot of TLC, but the body cleaned up real nice with a box full of red Scotchbrite pads and a sore shoulder. We cleaned the chrome, the Buick Wildcat wheels and other trim with very fine wire wool. The new whitewall radials from Coker really set the car off. On the mechanical side, after checking it all drove fine, we have recently treated it to new plugs, points, distributor cap, condenser, all the usual tune-up stuff. Plus we swapped out a leaking core plug at the back of one of the cylinder heads, fitting new head gaskets at the same time. The ’55 Pontiac heater system is pretty crazy – it pipes hot water right under the driver’s side of the car to a small radiator and then ducts the air out under your seat. This is why dual exhausts are tricky on this model – it’s right where the pipe want to go. Anyway, we’ve managed to get new rubber seals for that underseat heater duct, and it works great, which is handy here in the UK winter. We just found a little rust in the floor just above it so that’s on the list for fixing soon. Other jobs? Well, we found new wiper blade rubbers at the local parts store. New rubber pipes got the vacuum wipers working. We fixed the brake light switch. And our buddy Flat-top Bob at Owens Salvage in Wellington, Texas kindly sent us the correct cigar lighter to fill the hole in the dash. The interior is next on the cleaning list. It’s actually in great condition though some of the vinyl has gone a little sticky in storage. And the driver’s seat area needs a little sympathetic repair – a cool tartan blanket works for now. We bought some dropped uprights to get the front end a little lower so we need to install those soon. I suspect we’ll be trimming the front coils too, though it won’t be crazy low. Then finally we need to address the carburetion issues. It looks like the awesome 6×2 intake we bought for the car is a marine piece, so that’s not good news as the water outlets are tiny. So we’re looking for an Offenhauser 5028 3×2 intake for ’55 Pontiac now. If you have one, please let us know! 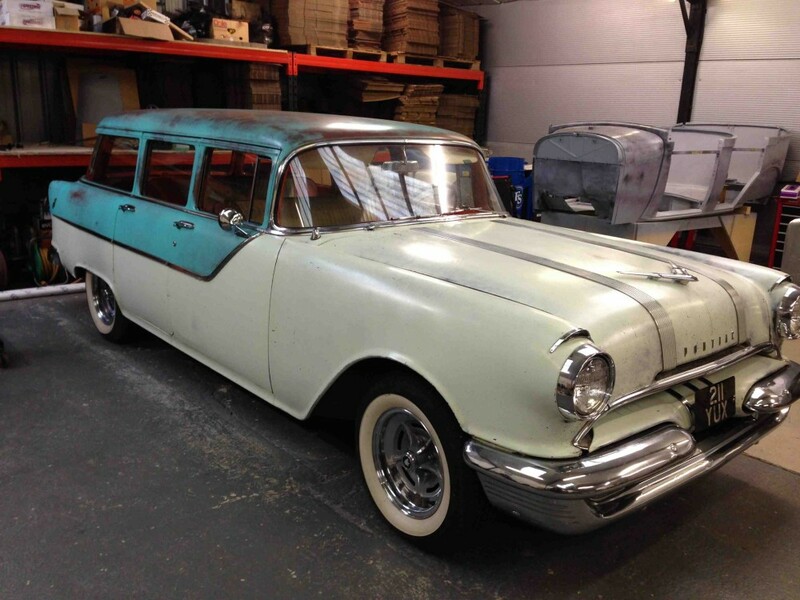 To read our first blog about the Stromberg Pontiac project, click here Thanks to California Pontiac Restoration (Santa Ana, CA) for helping source all the parts we need. Thanks to Rick for keeping on keeping on when the car has bitten back. And thanks for listening! We had a special order recently for a pair of new Stromberg 97s in nickel plate. So we sent some off to our usual plater and here they are. We kept the usual polished stainless steel parts like the kicker linkage and choke parts, but the main body castings are nickel Stromberg 97, as are all the small (normally) brass plugs, S-jet, needle valves, etc. They do have a slightly different, yellow cast compared with our usual chrome 97s, and you do see slight coloration marks over the castings that polish out once you get at it. We had heard that nickel plate is not to easy to keep looking good, but the plater said that actually, if you start with good zinc castings (like ours), they do keep their lustre. Anyway, if you fancy a set for yourself, please email us or ask your dealer. 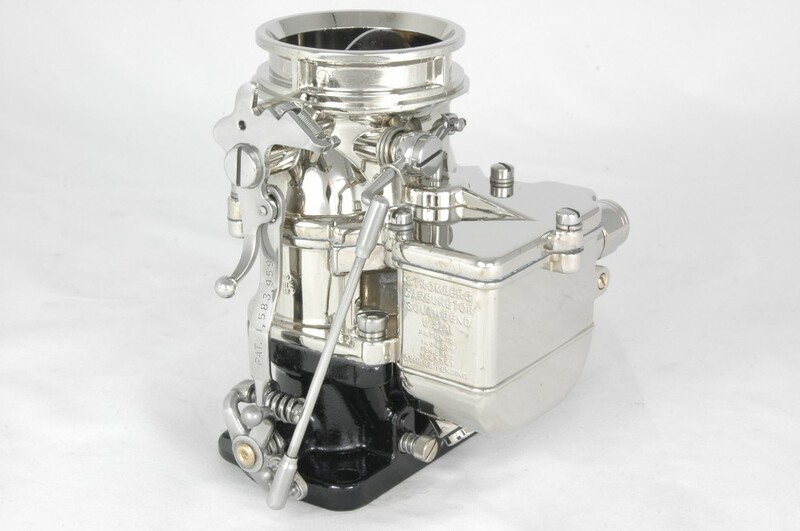 “Help, I bought a new Stromberg inlet valve (S-jet 9564K) and it is too small to fit the inlet hole on the carb body”. It’s a rare email to our tech email address, but we have had a few lately. Sadly these are old Stromberg carbs that have been retro-fitted with bigger inlet valves – a regular fix back in the day for wrecked threads. People would drill the old 7/16th thread out and retap it for half inch. I guess bigger threaded needle and seats were available back then, though we have never seen an original Ford or Stromberg drawing for a casting or inlet valve with a half inch thread. Good news is, our best buddy Max Musgrove at 97-Express sells a clever brass insert that will reduce your oversize inlet valve hole down to the correct 7/16th. They’re not expensive and will fix your carbs back to the correct size. The threads on the insert are 9/16″-18 OD. and 7/16″-24 ID. (standard). 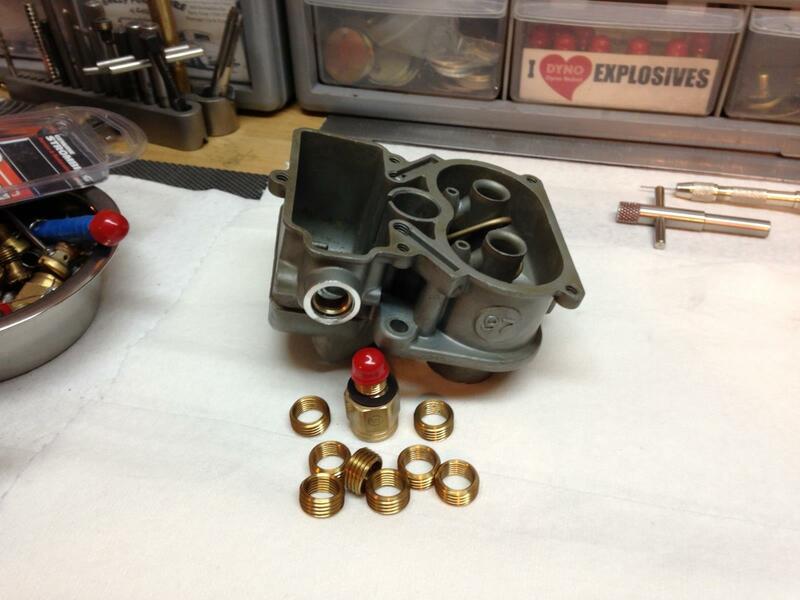 The carb needs to be drilled 33/64” and tapped 9/16″-18. Max uses a fixture for the bowl and spotfaces the gasket surface at the same time. Cost is just $14.00 each for the bush. Or $30.00 if he does the repair (recommended! ), as long as the carb has been stripped. This also includes spotfacing the jet plug and powervalve surfaces as well. Think. No leaks! Here are the contact details you need.